The newly paved Genoa Vista Trail will be dedicated this Saturday, January 26, from 10:00am to Noon. The dedication ceremony will start at the North end of the trail, near the junction of Carson and Main Streets in Genoa.. A short section at the north end of the trail has not been completed due to recent freezing temperatures. 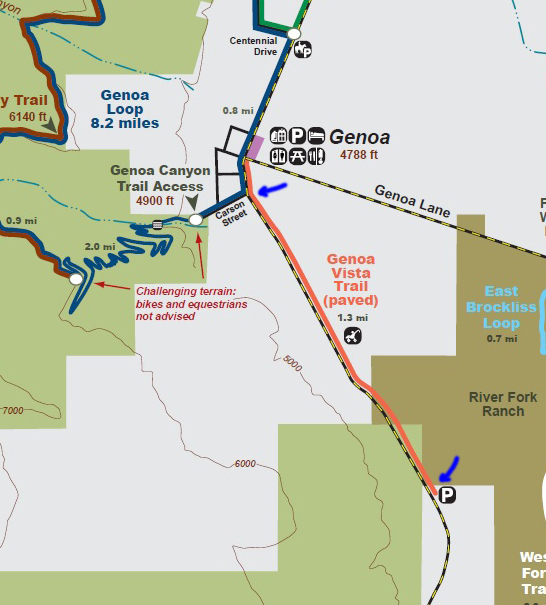 The Genoa Vista Trail is approximately 1.3 miles in length. It begins in downtown Genoa and meanders south along Main Street to Walley's Hot Springs and Spa. Parking is available at each end. A reception will be held at Walley's this Saturday at 1:00pm. Refreshments and entertainment will be provided. The cost of the trail was $750,000 dollars. Funding was provided by the Douglas County Redevelopment Agency, Nevada State Lands bond funds, and The Nature Conservancy. For more information about the dedication ceremony, phone the Town of Genoa at 775-782-8696.